The teachers and employees of Monthly Pay Order (MPO)-listed educational institutions called for an indefinite hunger strike onto 4th day on today.. Several hundred people, representing some five lakh teachers and employees of 37,000 MPO-listed academic institutions, have been fasting in front of the National Press Club since Monday demanding nationalization of their schools, reports UNB. The teachers and employees went on the hunger strike under the banner of Beshorkari Sikkha Jatiyakoron Liaison Forum. The joint secretary of the Forum, Md. Rofiqul Islam that MPO-listed non-government educational intuitions’ employees are being deprived of proper increment of salary and allowances in spite of their workload as much as their peers in the government institutions. Rofiqul claimed around 5 lakhs teachers and employees and 2.5 crore students of 37,000 MPO-listed institutions will be benefited if the institutions are nationalized as it will help lower the educational cost and increase the quality of education. 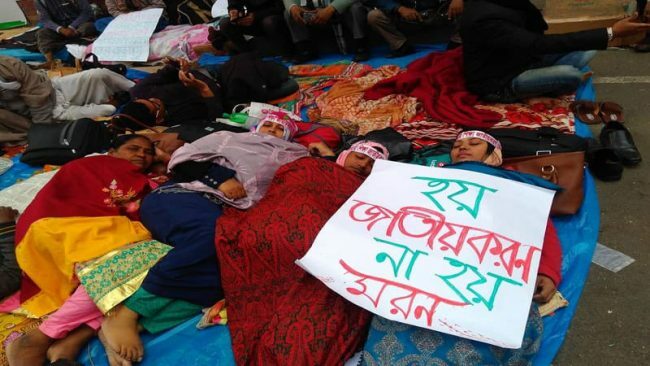 They started the demonstration from January 10 with a sit-in program and subsequently turned the movement into an indefinite hunger strike from January 15.